A Tide of Inequality: What can Taxes and Transfers achieve? Inequality is a top issue in the public agenda, partly as a result of the financial crisis that helped draw attention to this topic. As banks relied on the support of taxpayers and millions of workers had lost their jobs, people began to see the compensation of bank CEOs – with an average 2010 pay package of $9.7 million in Europe and the US – as obscene. Those at the top of society have long captured the gains from economic growth. From 1970 to 2008, the annual incomes of the top 1% of US taxpayers rose threefold in real terms from $380,000 to $1,140,000. By contrast, the incomes of the bottom 90% remained where they were in 1970 – at $31,500 per year (in real 2008 dollars). The top of the distribution is only part of a broader trend towards greater inequality. In the advanced countries, average wages grew by merely 5.2% in real terms over the 2000s and fell short of productivity gains. The subsequent redistribution from labour to capital income can be witnessed in dramatic declines in the labour share in countries such as Germany, where it fell by 3.9 percentage points per decade since 1991. Since capital incomes are more concentrated than labour incomes, these shifts in the functional distribution of incomes have negative repercussions for income inequality between individuals. The Luxembourg Income Study (LIS) confirms that rising inequality of market incomes has been the dominant trend in industrialised nations. Among the 19 economies where data are available for at least two points in time, 15 show increasing inequality. The long-run increase in market inequality is substantial in the United Kingdom, Finland, Germany, the US, Australia and Israel. Small declines in Switzerland and Romania (which has only a short time-series) and a larger fall in the Netherlands make for rare exceptions. The average increase in the Gini coefficient for private sector incomes was 0.28 points per year, or 2.8 points per decade. 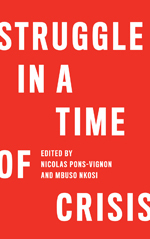 Governments can reign in inequality through minimum wage legislation and collective bargaining rights to compress the primary distribution of incomes. They can also focus on the secondary distribution of disposable incomes and use their tax and transfer systems to offset some of the inequality. The redistributive role of governments is often overlooked in debates on the causes of rising inequality. Much has been written about increasing wage differentials between low-skilled and high-skilled workers, which are routinely attributed to technological change or trade with emerging giants such as China and India. Inequality in the North is portrayed as an inevitable by-product of global economic integration and technological progress. This single-sided view leads to the false notion that governments can’t do much about rising inequality. Taxes and transfers: Which impact do they have? Yet, different governments have addressed the outcomes of the same market forces differently. Before taxes and transfers, Germany, France and Belgium all have higher market inequality than the US. 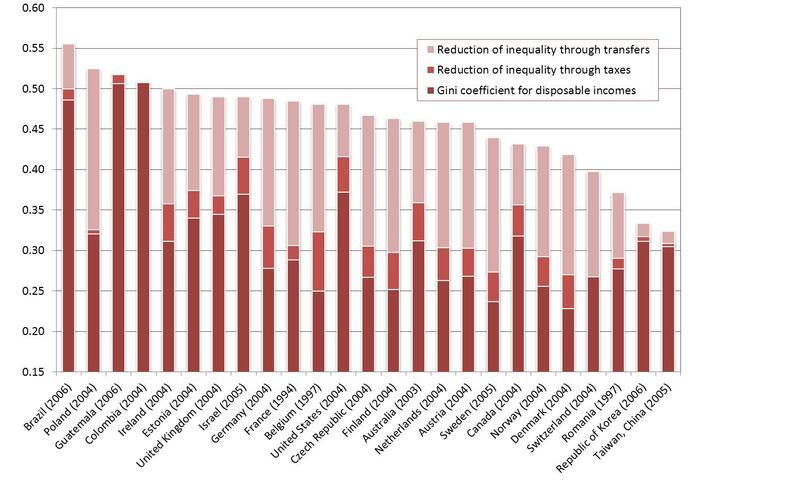 In egalitarian Finland and the Netherlands the initial Gini is only marginally lower than in the US (see Figure 1). As a group, the Gini coefficient of 0.46 in European countries matches almost exactly the average Gini of 0.466 of liberal market economies Australia, Canada, Israel and the US. 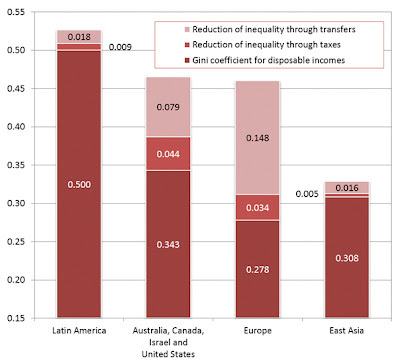 The key difference lies in the tax and transfer system: it reduces the Gini coefficient for disposable incomes to 0.278 in Europe, whereas it is left at 0.343 in the latter group (see Figure 2). Redistribution is more limited in the emerging economies. The three Latin American countries in the sample (Brazil, Colombia and Guatemala) all share high Gini coefficients for private sector incomes of 0.50 and above. Moreover, the region’s tax and transfer systems only slightly reduce the Gini coefficient (on average by 0.02). A recent World Bank study concludes that “a good deal of Latin America’s excess inequality over international levels reflects the failure of the region’s fiscal systems to perform their redistributive functions”. By contrast, economies in East Asia, where the initial distribution of capital was more equitable, have managed to achieve a low level of private sector inequality and arrive at relatively egalitarian outcomes without the need for redistribution (see Figure 2). Different policy choices also explain why the impact of long-run increases in inequality is more acutely felt in some countries than in others: Germany faced a sharper increase in market inequality (+0.402 points p.a.) than the US (+0.330), yet inequality of disposable incomes rose only moderately in Germany (+0.038 points p.a.) compared to (+0.293 points p.a.) in the US. 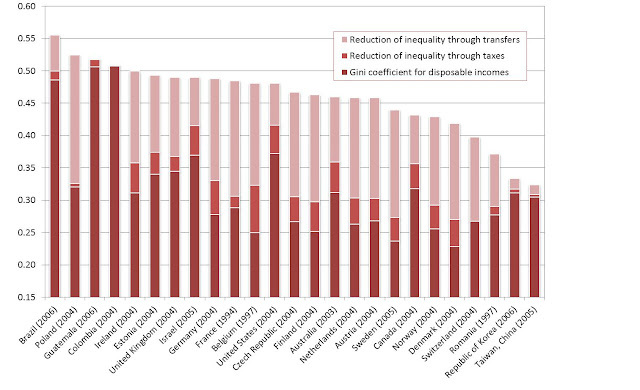 Sweden offset a modest long-run rise in market inequality almost completely. This shows that countries – even small open economies such as Sweden – still have substantial policy space in the era of globalization. So, why don’t the poor simply tax the rich? What drives the extent of redistribution? In the tradition of Joseph Schumpeter and Anthony Downs, the public choice literature has given some simple answers. It starts from the assumption that voters and politicians are rational, utility maximising actors, and then models redistributive outcomes. The argument runs that, the greater income gaps are, the greater the incentive for the poor majority to tax the rich. Politicians, always keen to win or regain office, will oblige and write ever-more generous welfare cheques. The problem with this theory is that legions of papers have failed to find any solid empirical evidence that links higher inequality to more redistribution. What explains the failure of the poor to tax the rich in countries such as the US? While there is evidence that the government is responsive to preferences held by the electorate, public policy is more responsive to demands from affluent voters and bears little resemblance to the views held by the poorest voters. This matters, since the views of rich and less well-off voters differ sharply on issues such as minimum wage legislation, welfare spending or taxation. Other researchers have found the same attentiveness to the concerns of better-off constituents at the level of individual US senators. The concern here is that inequality itself has corrosive impacts on democratic institutions. Shortcomings of representative democracy are only part of the answer. When considering unemployment and demography (i.e. the share of the population aged 65 years and above), there is no apparent difference in how the political systems of the US, France or Germany translate voters’ preferences into redistributive outcomes. The key difference are the inputs: whereas a majority of voters in France, Germany and other European countries believe it is the responsibility of the government to reduce income differences, the same statement finds support among only a third of US voters. This hostility towards redistribution is often linked to an unrealistic belief among the poor in upward social mobility. The irony is that social mobility in the US is no greater than in Britain – the classic example of a class-based society – and far lower than in Germany or the Nordic countries. If public opinion matters, it is worth winning the argument for a fairer distribution of incomes. The ILO has a special role to play as a global voice that defends the values of its Constitutions and challenges unfair outcomes. Having lost much of its ‘hard power’ due to declining membership, the union movement can use the ‘soft power’ of arguments to win support for social justice beyond its traditional base. The moment for this is ripe, given that the financial crisis has compromised the old model. It is a good start that even a billionaire such as Warren Buffet deplores that he pays lower taxes than his secretary. Note: The total height of the column corresponds to the Gini coefficient for market incomes (i.e. before taxes and transfers). Source: Luxembourg Income Study (LIS), see http://www.lisdatacenter.org/; analysis of micro-data completed between February and May 2011. The author would like to thank Janine Berg, Frank Hoffer and Sangheon Lee for helpful comments. The views expressed in this column are those of the author and do not necessarily reflect the views of the International Labour Organization. FT online, 2010 bank CEO pay, by Megan Murphy, June 14, 2011. All figures include capital gains. See World Top Incomes Database by F.Alvaredo and others. ILO, Global Wage Report 2010/11 and Datenblatt Deutschland. Geneva and Berlin, ILO. See the paper by A.B. Atkinson in: G.A. Cornia (ed. ), Inequality, Growth, and Poverty in an Era of Liberalization and Globalization. Oxford, OUP, 2004. E. Goñi et al., Fiscal Redistribution and Income Inequality in Latin America. Washington DC, World Bank, 2008. See papers by M. Gilens on Inequality and Democratic Responsiveness (2005) and on Preference Gaps and Inequality in Representation (2009) and by L.M. Bartels on Economic Inequality and Political Representation (2005). 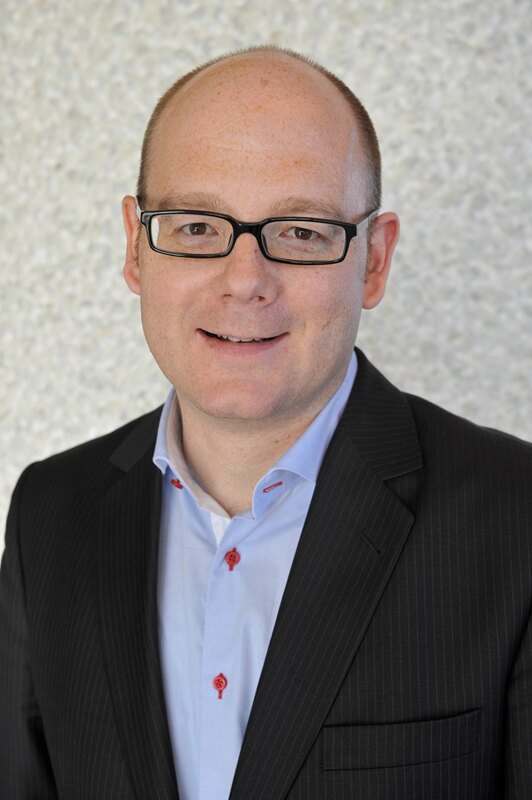 See M. Luebker, Income inequality, redistribution and poverty: Contrasting rational choice and behavioural perspectives. Helsinki, UNU-WIDER (forthcoming 2012). See the results of the latest round of the International Social Survey Programme’s (ISSP) module on Social Inequality at www.issp.org. See, for example, J. Blanden et al., Intergenerational Mobility in Europe and North America. See ILO (2011). Report of the Director-General: A new era of social justice. 100th International Labour Conference, 2011. Geneva, ILO. M. Luebker (forthcoming 2012). Income inequality, redistribution and poverty: Contrasting rational choice and behavioural perspectives. Helsinki, UNU-WIDER.